I eat meat in pretty much all of my meals, except breakfast (and even then it’s only as I know I shouldn’t really have a sausage roll everyday – le sigh! I blimmin’ love a bacon sarnie on a Saturday morning though!) Whilst I love vegetables, I have always been bought up having meat as an integral part of my meals. I often think I would like to eat more vegetarian meals but never really know where to start, and my boyfriend is very much of the opinion that you need meat to feel full, so my plans never go very far! So it was really exciting when AO.com got in touch to ask if I would like to take part in their Vegetable Challenge* – eating 6 vegetarian main meals in a week. Just what I needed to get me started with some yummy vegetarian recipes and to change our outlook on meat free food. AO.com think that vegetables are really underrated and many people aren’t getting enough of them in their diet, possibly due to the fact that people aren’t aware of the variety of veg readily available and of the many delicious ways they can be cooked. I certainly learnt a few new methods and recipes from taking part in the Challenge! The AO angels sent me six vegetarian recipes and all the vegetables I needed to whip up the new culinary delights. Amongst my fresh veg delivery I received aubergine, corguette, green lentils and artichoke hearts – which I would never usually buy as part of my weekly shop, as well as some of my regular faves sweet potato, red onion, chillies and spring onions. I couldn’t wait to get started! 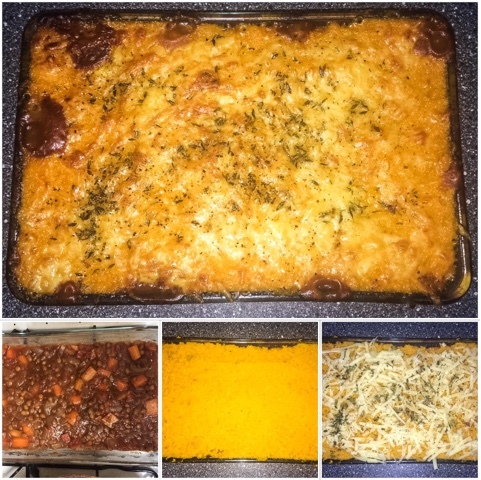 The first meal of the week we cooked was Veggie Shepherd’s Pie with Sweet Potato Mash. I say we – I had to work late so it was up to my boyfriend to get the Veggie Challenge kicked off! (which is why I don’t have the best pictures I’m afraid. He did text me a pic of each stage of assembly with the words “#TonyIsAVIB” (Very Important Blogger) though ahahaha! 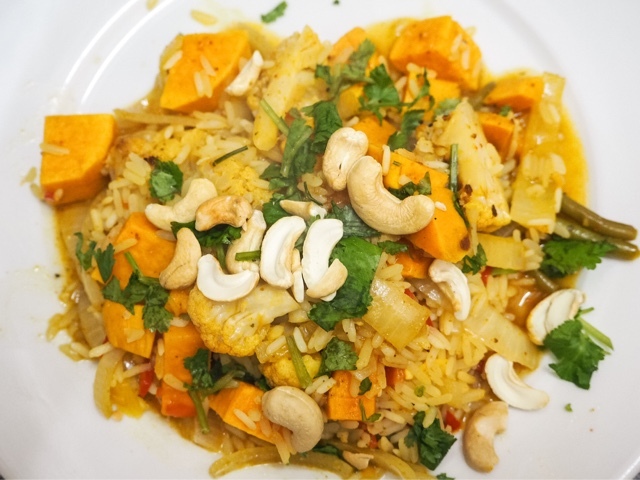 #SoCool This meal was amazing and a great start to the Challenge – even Tony found it really filling, and it was nice to have some really comforting food which was a lot healthier than its meat alternative. He made a huge dish full so we had it for lunch the next couple of days too, and it tasted just as good cold as it did hot. We’ll definitely be making this again! We’ve actually also made this several times since completing the Challenge, so you can see a better photo of a portion above. 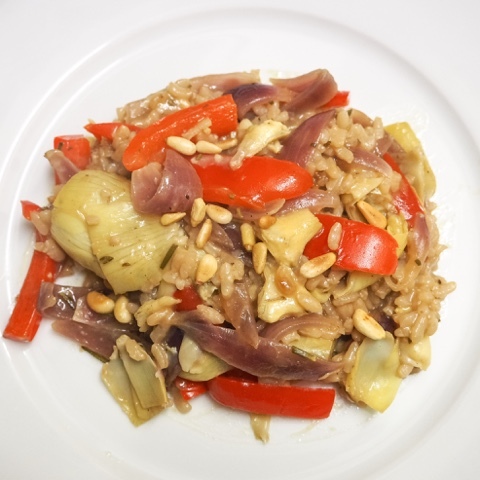 The next meal we made was Miso-Roasted Aubergine Steaks, which was unlike anything we’d prepared before. We’re both big fans of oriental food but have never cooked with miso paste before. It was a bit of a fiddly recipe, with lots of stopping and starting, but the overall preparation and cooking time didn’t take long at all, and the final product was so worth it! I’ve never eaten aubergine as a “steak” before, giving it centre stage in a meal but it was great and worked so well with the miso paste. The bed of sweet potato wedges again also made this a really filling meal. This was one of my favourite meals! I never make risotto as I’m not a huge fan of rice (I’m still reeling from a bad experience in Fiji in 2008! ), but this has definitely changed my mind! 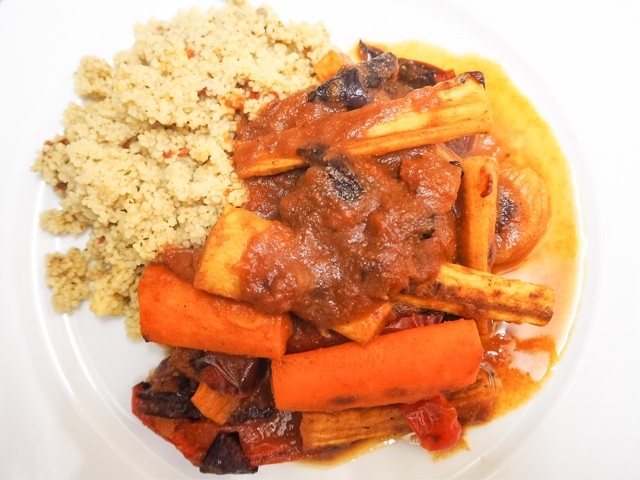 It was so simple and quick to make and was such lovely hearty food – perfect for the winter months! The flavours of the rosemary, white wine, Parmesan and artichokes were really rich and I’d be super happy having had this at a restaurant, never mind producing it myself in my kitchen! I’ve only ever had artichokes on pizza before but will definitely be trying out more recipes with it in. As it was a Friday night, and I was still riding high from the evening before’s rice success, we decided to make the Spiced Vegetable Biriyani. 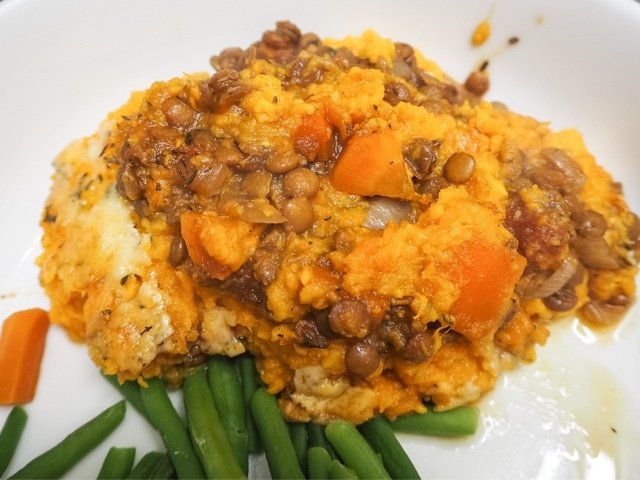 I was really excited to make this dish as I love spicy food and adore the main vegetable ingredients – cauliflower, sweet potato, onion, chilli and green beans. The curry was so easy to make, pretty much all in one dish. Unfortunately I wasn’t a massive fan of the finished meal and found it quite dry. I really liked the spiced vegetables but usually prefer my curries a bit saucier. I’d definitely like to try making a vegetable masala or similar saucy curry in the future though. I have to say this was the meal I was least looking forward to, and the meal I enjoyed the least. I’m not usually a fan of mixing sweet and savoury in my main meals so the apricots and honey didn’t really appeal. It was really easy to make though, but I found the dish a little bit bland and think if I made it again I would add a lot more paprika and chilli. I have become absolutely obsessed with this soup! 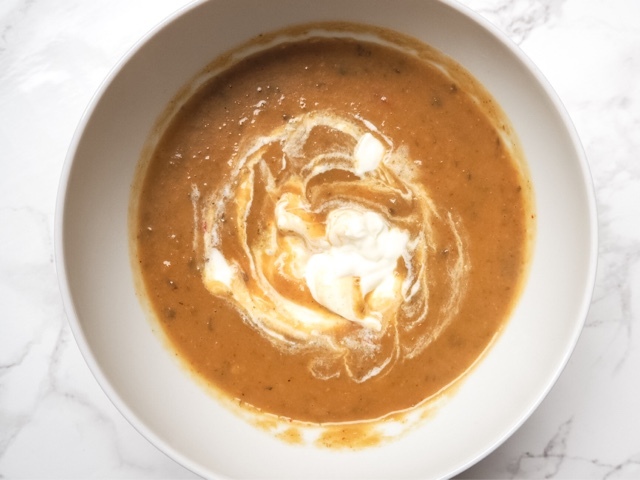 I adore root vegetables and this soup includes lots of my favourite things – parsnips, carrots, sweet potato, chilli and also green lentils which I was excited to start cooking with. Tony was very dubious that a soup would fill him up for dinner but it’s such a thick and creamy one (particularly with a dollop of creme fraiche stirred in) that it really is very filling. I love soup but am always concerned about the number of salt and additives in shop bought ones so am so excited that this one tastes as nice (if not nicer) than a supermarket brand and is also mega healthy. It’s the perfect thing to eat in Autumn / Winter and I made a huge batch of it again last weekend so my boyfriend and I could have it throughout the week for lunch. YUM! I’m so glad AO.com invited me to take on their Vegetable Challenge – not only did I survive, but I really enjoyed it too! We’re so lucky to have access to a real range of veg and I definitely feel more confident now trying new varieties and recipes. 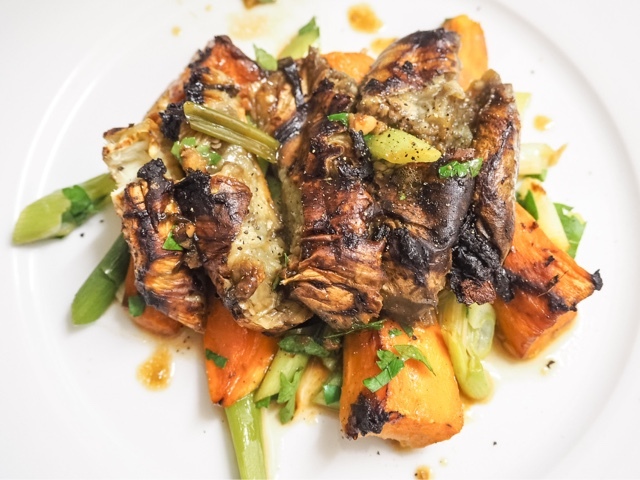 AO.com have put a whole heap of their favourite recipes in their online Recipe Portal so you can give the Challenge a try for yourself! Please leave me any links below – I’m really keen to try out more! *Thanks so much to AO.com for inviting me to take part in their Vegetable Challenge. All thoughts are honest and my own. For more information please see my Disclaimer Page.